The ASHAV High Point Awards Program recognizes competition achievements by registered American Saddlebreds in a wide range of categories and disciplines. 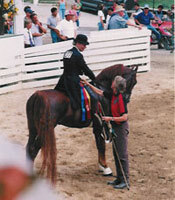 It is intended to improve competition opportunities for all Saddlebred owners, at all levels. To register for the program, please use the ASHAV Recording Application. To submit points, please use the ASHAV High Point Submission Form. Please note that submissions must be mailed to the registrar within 30 days of the show date. For complete details, please refer to the High Point Rules document.